This course was offered through Washington University's continuing education/night school arm called University College. This was the first semester University College offered the course. The students were enthusiastic about the material and rated the course as challenging but with an appropriate workload and assignments. They were happy with their intellectual development throughout with no major criticisms. They would have enjoyed having more students in the class but did not feel the relatively small number impacted the quality of the class discussions. In each of the sections the students rated all of the items either 4 or 5 out of 5. The truly global perspective. I didn't feel like we got stuck on one topic or one region. We also saw and talked a lot about how the themes of this course built on and interacted with each other. What would you tell another student about this course? That it's excellent! The readings are interesting and while some confirm what you thought, a lot were surprising. It was good to have your own biases brought out and examined and to think about what it means to be female, to be an anthropologist, to be an American. Very interesting. What would you like to tell the instructor? That she was really great. I appreciated how open to questions she was, how she challenged us to think, really engage with the material. I also enjoyed that she wanted us to share our personal experience and analyze what the issues of being a woman and intersectionality were in our own lives. This course was really eye opening and I enjoyed her as a professor. For the above course, approximately two thirds of the students took the opportunity to complete online course evaluations provided by the university (the full report is available upon request). 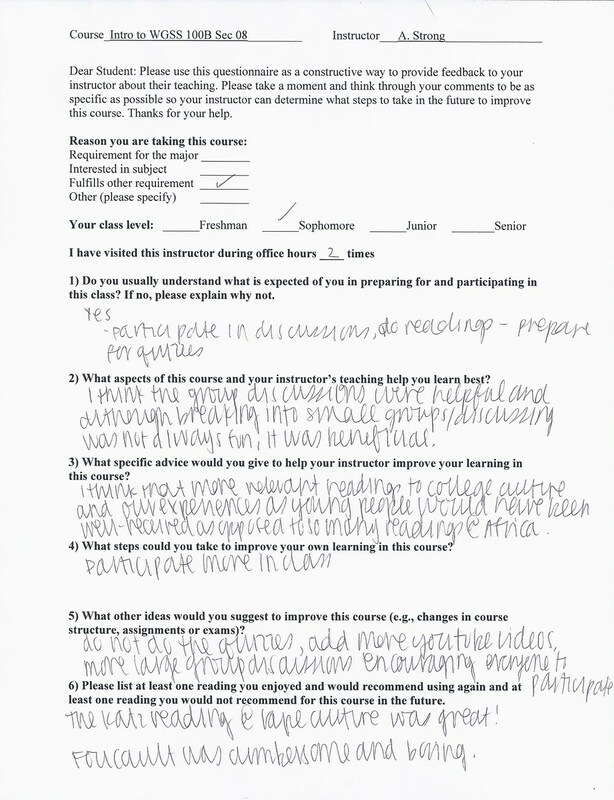 In addition to reminding my students about the online evaluations, I also asked them to take time at the end of the last class to complete a brief, anonymous course evaluation with which I provided them. 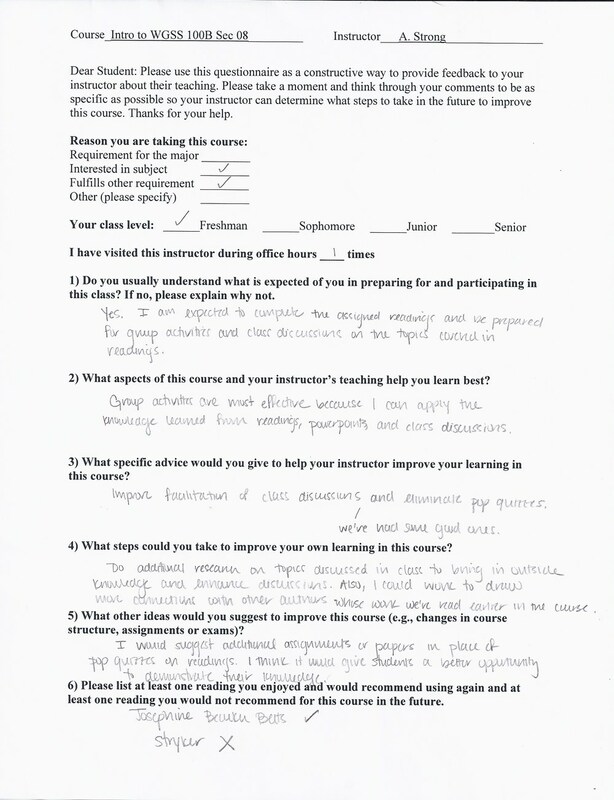 At the bottom on this page, you will find representative examples of their in-class evaluations. Overall, the students were most consistently happy with the diversity of opinions and scholars represented by the course texts and discussions. Due to the range of levels of academic preparedness and maturity, there was a wide range of opinions regarding the course workload and length of readings. Several of the students felt the readings were sometimes too long, though they admitted sometimes their inability to complete readings was due to poor time management. I sought to plan the syllabus so that between Thursday's class and the Tuesday's they had the longer readings, with shorter reading assignment for the Thursday class periods. Students were split in their opinion of class formats, some preferring large group discussions, and others preferring small group work. I found breaking the students into small groups promoted contributions by a larger number of the students as opposed to large group discussions, which tended to be dominated by a small number of the more outspoken or upper level students. In planning the course, I purposely sought to include a diversity of scholarly and personal perspectives, drawn from various cultural and sub-cultural groups. The students picked up on this goal and responded very positively to the class environment when asked about diversity and inclusion. The students themselves were a relatively diverse group and often contributed insights or popular media topics from their various religious, regional, national, and linguistic origins. In addition to the Likert scale-based questions, the students had the opportunity to respond to four short answer questions provided by the university and two which I posed to them, primarily about their most and least preferred readings (also present on the in-class evaluations, copies of which follow the typed questions and responses from the online evaluation). The questions and representative responses are below. I think that the subject matter as a whole was very fascinating, and I enjoyed learning about women's history and how we can make a difference in today's society. I liked the focus on Africa. My favorite part about this class was the more contemporary pieces and also the crossover between Western and non-Western feminism. Some of the readings were incredibly interesting (the Foucault reading, the Gender of Brazilian Transvestite Prostitutes, among others) and I learned about ideas, studies, and ways of thinking that had never occurred to me. Other readings I was already familiar with the ideas, but they were still cool too. I liked the class discussions and especially talking about topics that were relevant to my own life (women in science, Adichie's book). The wide variety of topics and perspectives discussed in class. I liked the topics discussed in literature and lectures. I enjoyed Professor Strong's infusion of her own research into materials discussed in class, particularly our focus on African countries. Many of these comments were related to the amount of assigned reading. The class met on Tuesdays and Thursdays. I planned the syllabus so students had from Thursday through Monday to read the longer/denser readings, trying to give them the most time to prepare those pieces. Several of the readings which were the most complex were required as part of the course's core readings across all sections of the course, such as the beginning of Foucault's History of Sexuality vol.I. It was my observation that the freshmen were unused to having to plan their time to deal with the reading from this and their other courses. For those who came to my office hours to discuss their concerns with the volume of reading, we discussed time management skills and ways in which to annotate or take notes while reading to guide themselves to the main concepts. The syllabus also includes questions to guide their reading, though most students did not avail themselves of this resource in order to prepare. They also did not like the pop quizzes, meant to be 10-point reading checks, which they had roughly once every other week during the semester. I prefer large group discussion to small group work, which we did a lot. I did not like the volume of readings we had every night, especially when they were redundant. The readings were very long and unfortunately I was rarely organized enough to split it up over the allotted days so that I could finish them and read them comfortable. This isn't a problem for the exams, as you only need to know the main ideas, and don't need to be familiar with the texts in great detail, but many of the texts were really interesting and I wish I had been able to read them more carefully, for my own sake. No room for real discussion. Everyone just parroted the correct answers taken from the reading. Learning about the waves of feminism was boring. Sometimes we had way too much/too dense readings for an intro course. The instructor promoted an inclusive learning environment with regard to the diversity of student personal backgrounds and identities. Please enter just the number on a scale of 1 to 7 where 1 is strongly disagree and 7 is strongly agree. Ten of the 14 students who completed the evaluation indicated "7"
Where relevant, please give specific examples to explain your answer above. Through the changing structure of class each day (lecture, powerpoint, group work, discussion) everyone was able to contribute. 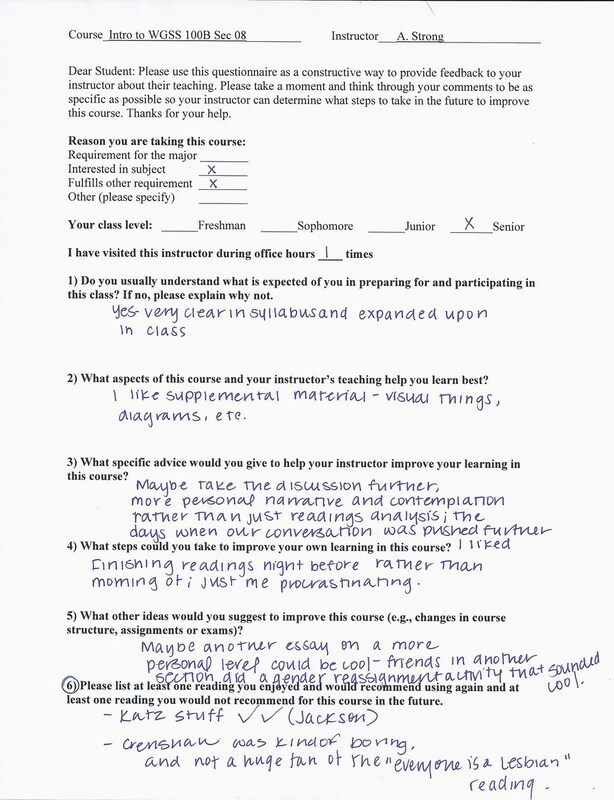 I think Adrienne did a great job in this class in regards to the question above, however, very personal subjects do come up and there were awkward moments. I think Adrienne handled the situations very appropriately. For the most part, Professor Strong was very inclusive, but sometimes I feel that she did not understand how people of different backgrounds (people who had an upbringing not in the United States) faced anti-feminist ways. Everyone felt comfortable voicing their opinions. Everyone was able to give their opinions in class and conversations were very open to people of all identities. Open to all ideas and experiences in class, always listened when someone had something to contribute to the discussion. Extremely true. There was a culturally diverse perspective of feminism. Almost every reading was by an author from a different time period and/or global location. Prof. Strong made sure to acknowledge how people from different backgrounds interpret different aspects of feminism and the women's movement as a whole. I appreciated our discussion of black women's perspectives on the women's movement and also our focus on the portrayal of women in third world countries in Western feminist literature. The instructor was respectful and very inclusive of each student of various backgrounds. The classes even addressed and included material from/about different countries, ethnic groups, social classes, etc. and didn't just stick to one group's point of view.